Upon the publication of her previous book, Drone and Apocalypse (2015), Joanna Demers told her institution’s newsletter (at USC’s Thornton School of Music), that the book “has a fictional premise, but it’s not a novel. 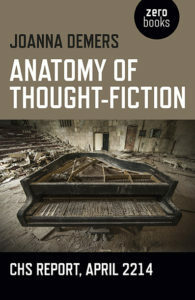 It’s not a fictional story.” Yet on her author website we are told that in addition to her scholarly work as a musicologist, Demers “has also written two novels,” one of them Drone and Apocalypse, the other her new book, Anatomy of Thought-Fiction: CHS Report 2214. On the new book’s back cover, its publisher, Zero Books, identifies it as a “philosophical novella.” The title of the book itself self-announces the split personality it seems to embody: “Anatomy of Though-Fiction” implies a philosophical analysis, a kind of metacommentary on an analytical strategy; that such an anatomy is apparently carried out in the “CHS Report, 2214” of course appears to suggest we should expect some version of a science fiction narrative or setting. Pointing out what initially could be taken as an apparent slippage between categories, on the part of both the author in conceptualizing the genre into which her work fits and the reader in determining the generic expectations appropriate to the work, is not to accuse the author of intellectual confusion or question these books’ integrity. It is first of all simply to indicate the dilemma Demers faces in attempting to establish a “creative” alternative to straightforward scholarly writing by invoking a “fictional” context in which to address the concerns pursued in the scholarly writing but without deferring to the usual scholarly protocols. The line between fiction and nonfiction, the creative and the critical, may have by now become blurrier and blurrier, but perhaps there is after all a point where to call an act of writing “fiction” only obscures that work’s actual achievement, as well as the ultimate utility of the term “fiction” to identify a form of literary writing the boundaries of which are not so infinitely elastic it effectively ceases to exist. Both Drone and Apocalypse and Anatomy of Thought-Fiction may take us to that point. Each of these books in in its way an extension of Demers’s 2010 book, Listening to the Noise, an unambiguously nonfictional work of academic scholarship that examines the musical genre she designates as “experimental electronic music.” Demers is clearly a devotee of this music, and her book attempts to discern why and if, despite its rejection of most of the traditional assumptions governing music and musical experience, and also despite its often radical transformation of musical “sound” beyond what many listeners would even consider to be music, listening to experimental electronic music could still be described as an aesthetic experience. The book demonstrates Demers’s thorough familiarity with all of the varieties of electronic music (including what is called “sound art,” the most radical metamorphosis in conceptions of musical expression) and is not so dependent on musicological language or wedded to academic procedures that it could not serve the general reader as an illuminating guide to the evolution of avant-garde ideas about music. A reader might indeed finish Listening to the Noise, however, with the sense that its author has not finally communicated all she might like to say about electronic music, that simply to establish a plausible role for aesthetic appreciation — however altered in its application — does not adequately attest to the profound effect this music can have, and that it clearly enough has had on Demers herself. This fundamental gap between what a scholarly book is able to express and the greater urgency felt by the writer toward the subject — the need to actually register the aesthetic influence exerted by the music — would seem to be the immediate motivation for writing Drone and Apocalypse. The focus here is specifically on drone music, and the book’s purpose, Demers explicitly tells us in the preface to the book, is to evoke “the ineffability of music through doing rather than just writing.” Presumably she means that the form her book takes, its “fictional premise and creative methodology,” allows her to do more that just explain or interpret drone music, about which it may be the case “there is nothing substantially new to say,” anyway. It allows her to “experiment with the ways [drone music] simultaneously evokes and deflects meaning,” which would appear to require that Demers engage in a mode of writing somewhat closer to literature. The book proves to be a critique of the notion of “thought-fiction,” defining it as “a concept that serves a purpose even though it is known to be untrue.” As such, thought-fictions are common enough phenomena of human discourse (to some extent being indistinguishable from what might just be called metaphorical thinking), but “Joanna Demers” contends in her manuscript that “they are especially prevalent, indeed unavoidable and indispensable, in our ways of thinking about music,” in fact “the condition for the possibility of musical thought.” The author supports this assertion first by looking at some of the common musical thought-fictions (that musical form can be construed as “architecture,” for example) and then by more extensively considering what are currently (current for “Joanna Demers”) the two related thought-fictions most strongly enabling discussion of music, pop music specifically: that “music is alive,” but also that “music is dying out.” The latter construction in particular allows Demers to insightfully survey popular and electronic music in the era of digital technology, and after the death of David Bowie, and account for the pervasive sense that somehow popular music as we have known it is reaching its final phase, that it is now indeed moving inexorably to its death (“there will never be another Bowie”). This commentary on pop music is supplemented with citations to theorists and philosophers such as Lacan, Marx, and Hegel, in a familiar academic manner, which unfortunately only reinforces the questions most readers expecting Anatomy of Thought-Fiction ultimately to cohere as fiction must likely develop concerning the designation of the book as a novel. Neither the analysis of popular music styles (which is itself perfectly coherent) nor the theoretical grounding seem the sort of thing scholars would immediately dismiss, so that it becomes difficult really to understand why it could not stand alone as a work of academic criticism without the gratuitous fictional disguise, which finally seems cursory and unpersuasive. A novel might indeed be written that performs aesthetic transformations with the notion of a “thought-fiction,” even as it blurs the line between fiction and expository discourse, but regrettably this book is not it. Daniel Green is a literary critic whose essays and reviews have appeared in a variety of publications, both online and in print. His new book, Beyond the Blurb, has just been published by Cow Eye Press and his website can be found at: http://noggs.typepad.com.